The stars of the new film "Mandela: Long Walk To Freedom" come to Paris for a red carpet premiere: your France 24 friends grill them on accents, icons, and Africa - and muse on the wisdom of making a film about a living legend. Nelson Mandela is, as we know, a global icon: the legendary anti-apartheid fighter hailed as the healer of a nation, and one of the most recognisable faces around. In the olden days we used to wait until our icons were promoted to a better place (to use a favourite euphemism) before committing their life stories to film. But in the age of instant, bite-sized, 140-characters-if-you're-feeling-verbose news, waiting for stuff is all rather last century. Which is perhaps part of the reason why Nelson Mandela's long, not uncontroversial life, is now yours for the viewing, for the cost of a cinema ticket. Madiba's hospitalisation last summer proved his popularity is enormous and far-flung, meaning the release of "Mandela: Long Walk To Freedom" is great news for fans and the film's producers alike. It's already attracting big audiences in South Africa and is expected to replicate that performance worldwide. The movie will be released in French cinemas on December 18th, but the French premiere happened last night (December 2nd), so off I went with producer Nicola and our cameraman Sylvain to meet the leading cast members, director and executive producer. I had already seen the film at a preview screening a couple of weeks ago and have to say that it's very well made: the narrative takes in an enormous span of time, and the leads do some fine accent work. There are beautiful shots of South African landscapes and the period costumes and settings seem to be spot-on, from the more vintage days up to Winnie's scary, mannish, shoulder-padded 80's jackets. I was very relieved to note that the film doesn't shy away from showing us Nelson and Winnie's not-so-saintly sides either: Nelson, played by Idris Elba, cheats on his first wife and participates in violence as the anti-apartheid struggle slides away from its Gandhi-inspired beginnings and into terrifying an-eye-for-an-eye territory. Naomie Harris steps into Winnie's shoes and gives us a journey from idealistic young wife to endorser of necklacing, and by the end she is a hard woman with a glint in her eye. Of course it's an uplifting watch to see Mandela 's journey from prisoner, to someone called upon by authorities to act as uniter, and finally a free man. And you don't have to be old enough to remember news reports from the apartheid days to be moved by the struggle: we see moments of pernicious everyday racism, extrajudicial killings, police brutality, prison humiliation, physical and psychological violence along the way. I, like many people, had heard of Robben Island and had a vague idea of what an island prison colony might be like. Seeing Mandela's account of what went on there re-enacted on screen is another matter. Idris Elba plays Mandela with subtlety, despite the weight of the impersonation he's called on to pull off. One tiny scene where Mandela is unable to read a letter from home because almost every word has been cut out by prison censors is quietly close to heartbreaking. Having said all that, I left the screening room with a slight sense that it could all have been better somehow. The film closes on an optimistic note - Mandela has united the nation and staved off what could have turned into a bloody civil war. Thanks to our magic status as time lords living in the future, we audience members have one over on the characters in the movie and know that Mandela lives long after his release (and of course ends up meeting the Spice Girls, proving that even Madiba can't have it all). But - yes, sorry, there's a but - I just felt that it was all a little too easy to drop the story at that optimistic point. It's almost twenty-four years since Mandela's release from jail, and a lot of water has passed under South Africa's bridges since then. I know the film is based on Mandela's own memoirs, which were published in 1994, so the story had to stop at some time before that. I think I just would have liked to have felt that the film was in on what I know about South Africa - perhaps a "Life of Pi"-style treatment with Mandela recounting the story to his descendants, to put it all into the context of his country's ongoing journey. It's not much of a quibble, and the director, Justin Chadwick, was a very nice man who answered all my red carpet interview questions with thoughtfulness and sincerity, so I feel mean criticising it too much. Idris Elba and Naomie Harris also talked about the danger of portraying Mandela as a saint - and Naomie particularly of "not being seen as spokeswoman for Winnie Mandela". I suppose I just wonder if perhaps Mandela's icon status and the fact that he's in such frail health might have prevented Chadwick and executive producer Anant Singh from taking that extra step back from the original text. It's a tough call to make a film about someone who is still living - they or their relatives might see it and dislike your take on their story, which could be awkward, unless you deliberately set out to do a hatchet job. Maybe this situation is an inevitable - or rather, irresistible- consequence of our media age and the constant clamour for more information, stories and pictures. The recently-released Wikileaks film "The Fifth Estate" certainly seems to have fallen into that bracket, coming out as Wikileaks founder Julian Assange's story remains very much in stasis, stuck in the London Ecuadorian embassy. Assange hates the film, and audiences don't seem to know what to make of it. Margaret Thatcher's life, elderly years, and most controversially, her Alzheimers were fictionalised in The Iron Lady even as the real iron lady faded towards her death that came just over a year later, leaving a bad taste in many a mouth regardless of its owner's politics. On the waiting-til-its-all-over side, but only just, we had Zero Dark Thirty, bringing the death of Osama Bin Laden to the big screen only a year and a half after the event. Compared to those films, "Mandela: Long Walk To Freedom" is practially a period piece. But it all makes me wonder, do movies like these help us to get a grip on contemporary lives and events, or should we shut the book on them, let time mature our thoughts, and make the film after a nice bit of old-fashioned reflection? 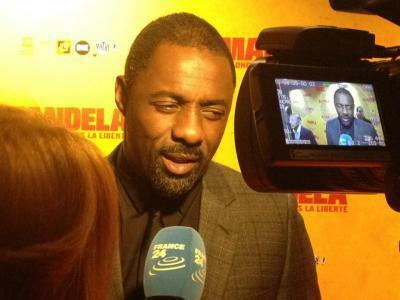 Watch our interviews with Idris Elba, Naomie Harris, Justin Chadwick and Anant Singh on France 24 on December 18th. Catherine Nicholson presents the news and Culture on France 24, and reports from the field on events from the Cannes film festival, to street demos and court cases. This blog is a personal view on some of the events and details that don't quite make it onto your TV screens.